I recently spoke about my reasoning for returning to work, I needed to feel like I had another purpose and in all honesty being at home with little income for yourself meant it got a little lonely. Whilst on maternity leave, I would be bringing in the pittance that is maternity pay along with some extras from my blog which could vary from £150 a month to over four times that and though so months meant I had an extra lining in my pockets, other went by where I really had to watch my pennies. I didn't enjoy that. John has always been a 'provider', bringing in the majority of our income, but that doesn't mean my wage meant nothing, I was very keen to have that back - thus returning to work 3 months earlier than I could have. It's so easy when on maternity leave to have rows heated debates, over who has it harder, who's really 'providing' for the household. Is it John because he's out all day working hard to earn money, or is it me, at home looking after the children? I could argue that if I didn't look after the children, he couldn't work and he would argue that if he didn't work, I couldn't afford to be at home with the boys. A never ending circle of us both wanting the monopoly of hardship. 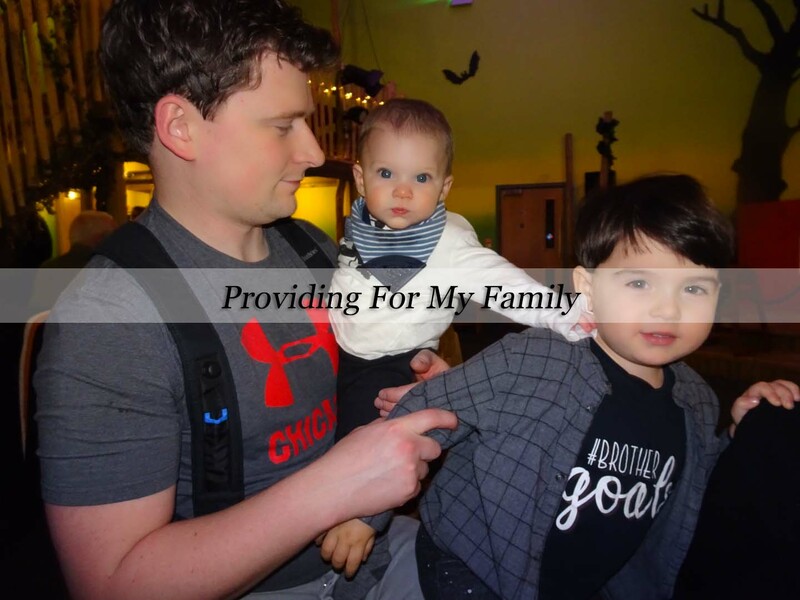 Thankfully those moments were rare, we had an understanding after having Patrick that we never really had during my maternity leave with Noah, we both provided, John the financial and me the care, together it made one rounded approach to raising our boys that worked for us. But it's incredibly difficult sometimes, when you're at home having a hard day not to feel a little peeved when your other half returns claiming they've had a tough day, sometimes you'd long for their version of tough, to get out of the house for a few hours and have some adult interaction, not be puked on and actually get to listen to something other than Paw Patrol or Baby TV. In that moment it feels impossible to remember the other side of the argument. I'm thankful that John is very understanding, he isn't obtuse in realising that we both provided even though I wasn't bringing in a definite wage packet each month. WayToBlue recently found out that due to societal thinking, many parents actually do believe that the main provider of the family is the working parent with 78.1% admitting the main provider in their family typically takes responsibility for the financial support of the family. And I can fully understand that, quite often when I was on maternity leave with Noah, if John came home and I asked him to look after Noah it would leave my Nan (From a totally different era) aghast, even still now she is adamant John does a lot with the children 'for a man', which can be a little frustrating for me. John is their father as much as I am their mother, in the eyes of the law none of us have more right to the children more than the other, but there is some sort of view that when he's taking care of the children it's merely a babysitting situation rather than 'him actually parenting his sons'. I was really shocked to read 68.8% of parents admit either themselves or their partner have referred to this as babysitting - as I thought we were really moving on from that kind of view. I'm well aware of the statistics on peoples view of who 'provides', and it probably did slightly impact my choice to return to work earlier than planned. I did miss a lot of the other perks of working, yes believe it or not it isn't all doom and gloom. I got a dinner hour, a WHOLE hour to myself to do whatever I pleased, I spoke to other adults about things that weren't children (although working in childcare, that isn't always the case) but best of all, I got a full wage again. I think over the past nine months I had forgotten just how much of a difference that extra income makes, the margins are huge and I do feel that bit more independent again now I have my working wage back. We head off on holiday in less than three weeks, my wage has meant we are a lot more flexible on what we can do and spend whilst we are away, because who wants to be totally constraint by pennies and pounds when you should be enjoying yourself in the sun? However, it all comes back to the word providing, I realise now that I am bringing in an income again, that I wasn't providing any less when I didn't have that. I don't now believe I provide more for my family. Me and John will always be equal in that respect, we split most things down the middle, from the jobs at home to solo time with the children, we both get out of the house with friends and family and we both put money into the household. We have our parent pact I guess you could say, and we know what works for us. We're both providers, providers in money, care, affection and love. I can certainly understand both sides but I honestly think being a stay at home is way harder than being at work all day long even if you work long hours. I have said it many times before going to work really is the easy option!! !